After looking all day Friday, I realized that I didn't have any more Red Heart white yarn. So off I went to the local box store (AC Moore) and quickly found the right yarn (Well actually it Bernat, but..) and while looking for some drab colors of sock yarn (I am easing my S-I-L into hand knit socks.. once he is addicted, I know brighter colors will be fine, but for now, grey, or navy, or forest greens are preferred) I found one I liked—but they only had 2 skeins (Kroy, color way eclipse—a self striping yarn of greys, blues, and white) but... they also had this--Meadow Colors. Do I already have some skeins of this yarn? I don't think so, or if I do, its a duller version of the color way. Do I need more sock yarn? Hell NO! What with knitting sweaters and hats and stuff for the babies, and hats I have designed, socks have gone by the wayside. I have completed 2 pairs of sock this year! That is, in 2014. If you go back 12 months, the number increases to 3. 2013 wasn't much better, but 2012—a dozen! And some years before that, more than a dozen in a 12 month period. So I am not knitting socks like a fiend, but I am still buying sock yarn as if I were. But enough of my foibles. The Hats. Here they are. Off, they are simple triangles, and simple candy corn. 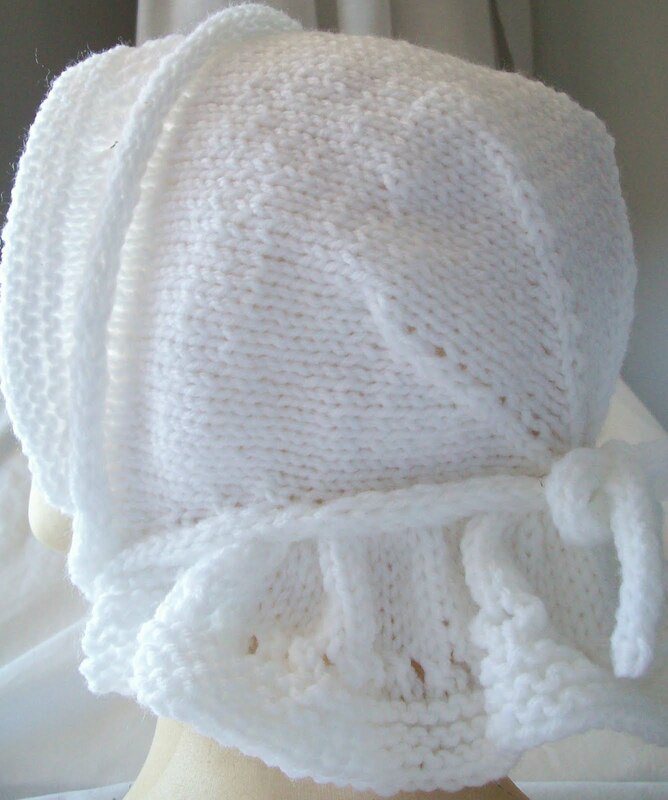 Refold, and you get a somewhat squarish shape of a baby bonnet. On HEAD, (who is really a woman’s small size head, they become cute little caps, that cover the ears. On the girls, they will be less stretched, and the top of the hat will stick up a bit more. But even on HEAD, they look like candy corns. Of course, I now have a huge amount of acrylic yarn.. The white might find its self paired up with some solid red and green, and an Christmas ombre (red white and green) to become Christmas stocking for the girls. My DD and S-I-L live in a small (2 bedroom) apartment, and DD has laid down strict orders for the holidays. 1 (per child, or 2 in total) toy as gifts, per household. So Grandfather (and wife) and Grandma (and husband) , and the other Grandpa, (and wife) and I, each can only give 1 toy (or 1 set of toys). This is still a lot of toys, (4 toys for each girl—not counting what ever their parents buy!). We are not limited to only 1 gift. I can make hats, or mittens, or Christmas stockings, or buy earrings, (the girls have pierced ears) or clothing or put money in their savings account. The limit is just on toys. Hats are definitely on the list, and maybe Christmas stockings, too, and earrings, and of course, a set of toys! I am so ready for this pattern. That Candy Corn hat is so fun!